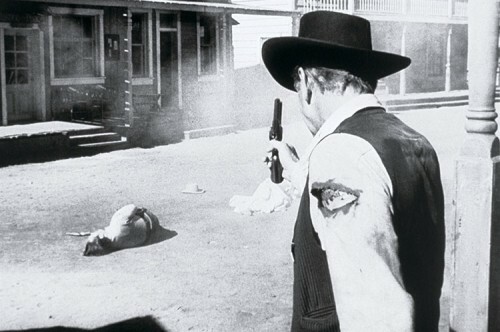 An Old West shootout took the life of John R. Ferris (1839-1869) in Davisville, now Davis, California in 1869. 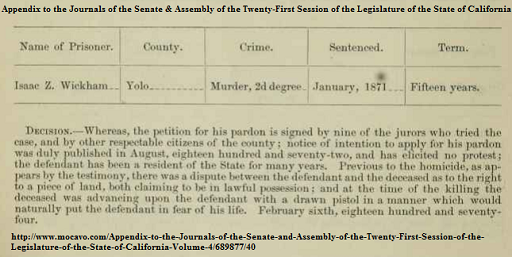 This is the story and just about all we know about John R.
On Aug. 13, 1869, John R. Ferris was shot and killed near the Tule House, in Yolo by Isaac Wyckham in a land dispute. Convicted and sentenced to 15 yrs, the murderer was pardoned after serving three years. In the fall of 1869, Isaac Wyckam killed a man by the name of Ferris, in this county. The cause of the homicide was a difficulty about a land claim. Wyckam is yet in jail awaiting his trial. John R. Ferris was the son of Luthren Ferris (name as spelled on his gravestone) and Catherine Hapeman. John was the 6th great grandson of Jeffrey Ferris through his son, Joseph. He came to California, it may be assumed, via the Ferris cluster in Hillsdale County, Michigan. Two curiosities about this murder. The defendant was only sentenced to 15 years, then pardoned after about three. The image shows that the state felt that it was, in all reality, self-defense. It is not at all clear how the conviction was obtained, but the prison sentence is very short. use the death penalty. For about 50 years, there was not one execution in the county. Native Americans and those of Chinese extraction were especially grateful as they were subject to hanging throughout the rest of the state of California.